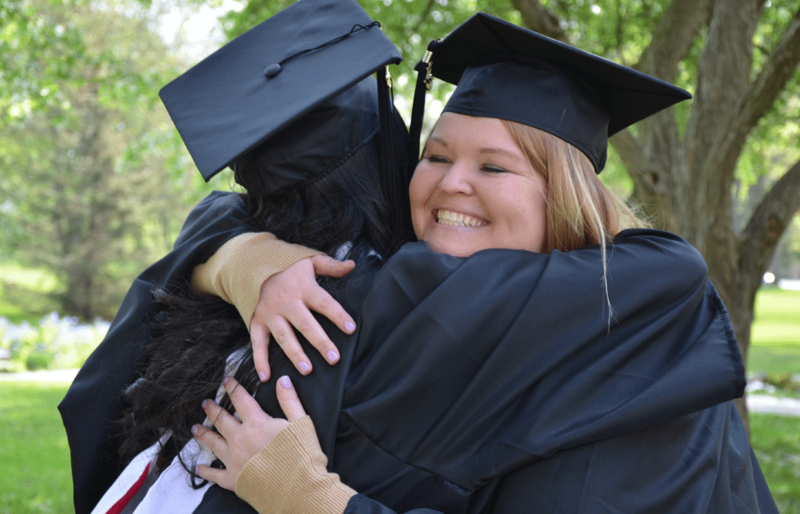 Priscilla Nava and Sarah Witt fervently cheered for each other as they crossed the Saint Mary’s University commencement stage Saturday—one obtaining her bachelor’s degree and the other earning her master’s degree. Witt, formerly Nava’s teacher at San Miguel Middle School in Chicago, once counseled Nava and her other students about the importance of going to college. And, Nava says, it was Witt who inspired her to love learning. When Nava chose to attend Saint Mary’s, Witt’s alma mater, they found another shared bond. Witt had earned her elementary education degree from the university in 2003. Fulfilling her lifelong dream to teach, she began working at San Miguel through the Lasallian Volunteers program, and then continued as a salaried teacher. The five years she spent at San Miguel in Chicago were “eye opening” for a young teacher from the quiet middle-class city of Northfield, Minn. Suddenly it wasn’t “just” about helping her students with their academics, it also included counseling them about life outside the walls of school—a neighborhood that included gangs, drugs, and violence. Nava is one of the students with whom she has stayed connected. Visiting Nava meant coming home to Saint Mary’s. And for Nava, a visit from Witt was a reminder of home. Witt, now a teacher at Dodge Middle School in Farmington, said she had always planned to return to Saint Mary’s to obtain her Master of Education degree, and she hasn’t regretted her decision. “I loved it,” she said. “I really liked the whole program. I didn’t know how much I was going to grow as a teacher and how it would all circle back to the things I learned in the undergraduate program and through the Lasallian Volunteers program—how all those virtues are present in teaching even if you’re not teaching in a Catholic setting. Witt will take these skills back with her to the classroom, where she works with math intervention students in grades seven and eight. She assists students whose math scores are 40 percent or lower. “Teaching is rewarding in itself,” she said. “But working with kids who struggle, you have to come up with so many more activities or ways to approach the lessons. You have to think about what is going to help them succeed. It is extremely challenging, and there are days I am wiped out. But to hear a student say, ‘I got it’ or when I watch one of my students explain it to someone else who is struggling … when they can help each other, that means I have done my job. That is so rewarding. On Saturday she and Nava shared many of the same feelings of accomplishment. Nava, a First Generation Scholar, majored in Spanish and minored in biology. With a strong desire to help others, she plans to get a master’s degree and eventually become an ER nurse. In addition to Nava and Witt, 275 graduate students and 244 undergraduate were eligible to commence Saturday. Go to smumn.edu/photos for more photos from the day, and check out the video highlight below.